While we wait for news about a new launch date, we have started to prepare our satellite for a ‘power nap’. This involves removing the battery arming plugs and discharging the battery by 50%, which will help to prolong its life. We are also putting the ground support equipment in a safe and dormant state, including moving some of the mechanical ground support equipment and one of the hydrazine fuelling drums from the fuelling platform to the cleanroom floor. The launch delay also means that we are busy replanning travel etc for all the teams involved. We should get confirmation of a new launch date early next week. 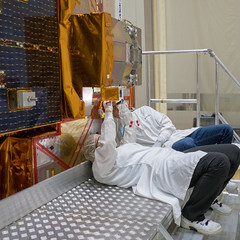 For information about our Sentinel-3 mission visit www.esa.int/sentinel-3. From the ESA Sentinel-3A team at the Plesetsk cosmodrome in Russia. In the Cal/Val calendar, a tentative date has been set (16.02)… is it just a guess? A real possibility? Confirmation of a new launch date should come early next week, but they are currently looking at a launch window between 16-20 February.